Tips to Fix Computer Loading Slow Windows 7, 8, or 10 - Inn Geek - Inn Forum - Powered by InnJoo! Why Computer Loading Slow Windows?Things behind the computer loading slow windows, the new computer works very fast at the time, after some days using slow loading, getting irritated and suddenly it freezes. This situation does not only faces me and you, many people, particularly who uses a computer in the Microsoft Windows platform. Then after many people think to format or reinstall the operating system, but before goes to install new operating system need to backup your needed files, it takes much time. Why not you fix Computer Loading Slow Windows without installing a new operating system?Just keep in your mind, reinstalling operating system it takes much time and after installation completed is not solving your issue, needs to install all drivers and software what you're needed to work daily in your computer. then there is a way to fix it, just follow the below steps what you choose. Uninstalling unnecessary software:we are installing many programs on our computer for different purposes, but after completing the task we didn't use that particular software again. But its running in the background of our operating system, later its burden the RAM memory lastly it getting slow to the loading services of the operating system. So, check your system what you are not using or rarely using programs and just uninstall it for better performance of the Windows operating system. Go to Start Menu → Control Panel → Programs → Uninstall Programs → Check What you want to uninstall. Move the cursor to the right side corner → Appears a menu → Settings → Control Panel → Programs → Uninstall Programs → Check What you want to uninstall. Go to Start Menu → Click on Settings Icon → Apps → Check What you want to uninstall. Deleting unwanted data in 'C' drive:We know to store data on our drive in our computer, but how much safe it is. Yes, saving data to drive our computer much need to know, which drive is safe, when if the operating system is corrupted or crash is effected to 'C' drive in our computer. Because all the contains of the operating system and programs related file is stored automatically in the 'C' drive only. If you install any program on your computer, that programs install in your 'C' drive location. Many users are saving the personal file into 'C' drive, but it's not safe and not good to the computer. Whether if over the space of 'C' drive affected the performance of the operating system and programs. On that time move your needed file to other label drives like D, E, For any other drive located in your computer. But didn't stored to 'C' drive of your computer. Sometimes programs create cache file and unwanted temp files, it causes over the space of 'C' drives then it's getting slow loading and performs of the computer. Preventing these situations just follow the simple tricks like clearing temp file, prefetch files, recent file history in your computer. How to clearing temp files, prefetch files, recent file history in your computer? Go to start menu, search for the Run application or pressing the combination keys of Win + R → In the Run box Type temp and press Enter → Delete all the temp data. Go to start menu, search for the Run application or pressing the combination keys of Win + R → In the Run box Type recent and press Enter → Delete all the temp data. Check the recycle bin and delete the data. Before clearing temp, recent files history or prefetch files, save the data of your needed application files and close the running applications, check it once of your data saving in your choosing location or not. Easy things not responsible for bricked devices, dead SD cards, please do some research if you have any concerns about features included in the produces you find here before flashing it. Your warranty will be void if you tamper with any part of your device/software. When the install some application on our computers, its asking permission to automatic updates. when if connecting the internet, its causes automatically update without intimate to us. Finally, it's getting slow and not responding, because of updating in the process need RAM memory to use internet act as like background task. Check once to which application will automatically update. Working on Windows platform loading software and performance is majorly depends upon the processor and RAM memory of the particular computer, if you are running software on your computer, opening and closing of software are depends on the RAM space and processor speed. Some of the software's are utilized huge amount of RAM on your computer, because of need graphic acceleration and background tasks. Majorly graphics-based software like video editing, photo editing, high-end graphics games and etc. But, we have remembered the software which gives user interface and output of the result. In the web many software are available for alternatives then why not you use alternative software for releasing some space of your RAM consumption. Getting Windows slow loading day by day, it means some history and cache is utilizing memory in your computer. So, need to clearing history and cache memory of unwanted files. When the opening Windows operating system involves many programs running background, those programs are ready to use when the opening of the computer screen, that why those programs are loading what programs are installed in your computer, especially programs place icons of the desktop. But all programs are not needed to used when the opening of the computer. So, stop the programs loaded the startup up of the computer it gives better performance and faster-opening windows loading. 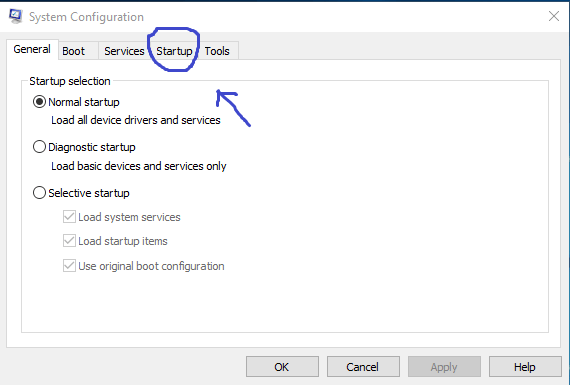 How to stop startup programs to fix Windows slow loading? 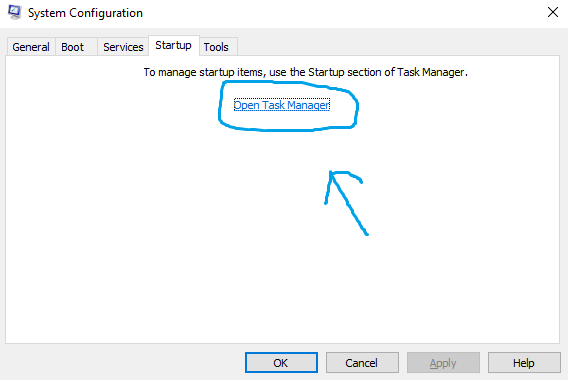 Go to start menu, search for the Run application or pressing the combination keys of Win + R → In the Run box Type command msconfig and press Enter → Startup → Open Task Manager → Right Click the unwanted startup programs → Disable it. Go to start menu, search for the Run application or pressing the combination keys of Win + R → In the Run box Type command msconfig and press Enter → Services tab → tap to Hide all Microsoft Services → Unmark the unwanted program services → Apply → Restart. Note: If you forgot to tap hide Microsoft services option, may be affected the Microsoft related programs working.